Completely redesigned and lengthened, Rock Manor has been lengthened from 5,779 yards to an 18-hole, 6,405-yard championship design by renowned golf-course architect Lester George. Completely redesigned and lengthened, Rock Manor has been lengthened from 5,779 yards to an 18-hole, 6,405-yard championship design by renowned golf-course architect Lester George. Additionally, the course boasts new tee boxes, greens, bunkers and fairways. A state-of-the-art irrigation system makes for top playing conditions all season long. Rock Manor is certified as a Cooperative Sanctuary by Audubon International. The course is committed to protecting our local environment, conserving natural resources, and providing wildlife habitats. 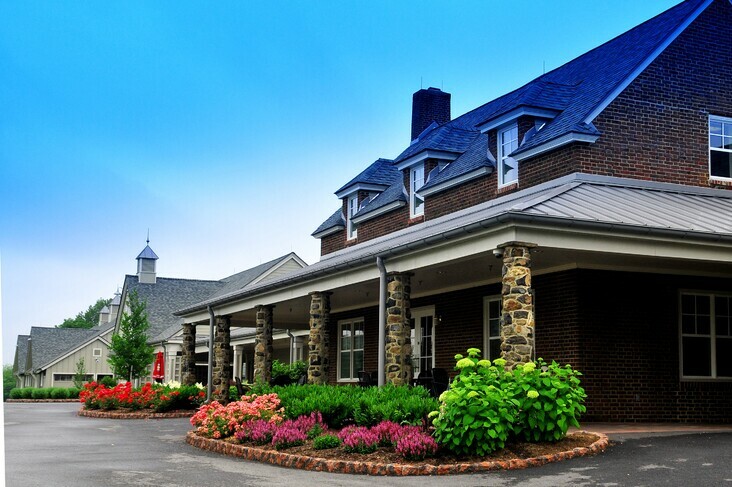 The social center of Rock Manor is an elegant yet comfortable clubhouse offering guests a well-appointed Golf Shop. A circa 1921 building has been restored to retain the flavor of its original structure. The On the Rocks Pub features a full-service bar & grille, which serves breakfast and lunch daily for golfers and non-golfers alike! We offer a great selection of favorites including sandwiches, salads, seafood, and our ½ pound burgers along with over 20 different beers to compliment them. Enjoy our dining room or outside seating over-looking the course! 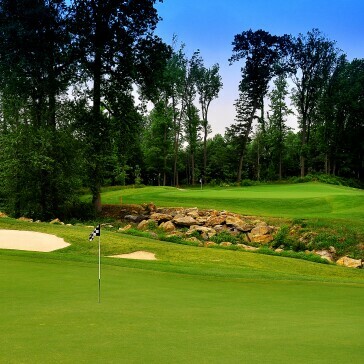 Rock Manor offers a full range of practice options to suit all skill levels of golfers. These include a large undulating putting green, chipping green, driving range and short game area. 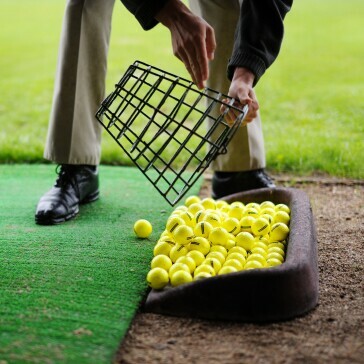 Our two-tiered driving range offers state of the art synthetic astro turf. To practice on your scoring game head over to our short game area which includes 3 bunkers and multiple target greens. Designed for all golfers, regardless of skill level. You decide when and how much you practice and save with a one-time payment of $499. Additional terms and conditions apply. 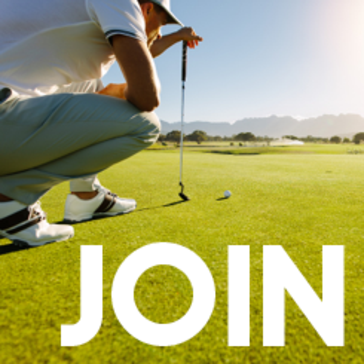 Range and course access subject to availability. Cannot be used for league or outings. 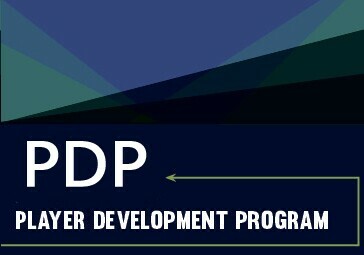 Program requires a 12 month commitment. The program is subject to change without notice. Hours of Operation - Range is open from dawn until dusk and closed Wednesday mornings until 11:30am for maintenance. Range Lights are until 9pm on Thursday, Friday and Saturday nights in season. Surprise a special someone with an Rock Manor Golf Club gift card. This gift card can be used toward any purchase at Rock Manor Golf Club. 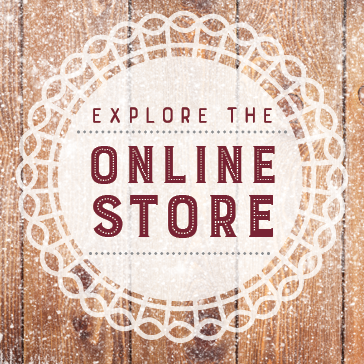 Rock Manor's Online Store has everything from Gift Cards to Special Offers! Click the link below to see what's available online!